Arg2 is a Great pellet! I had nvr seen my 5 aros eat pellet so greedily before.! Their stomach is very bulging, they eat arg2 like no there is no tomorrow! Will definitely buy again.! Looking forward for the big pack! How big are your 5 aros? Currently we have only the small packet for sales in our retail shop in our farm. The bigger packing will be rolling out by this month end to local fish shop. The reason that we did not distribute the small packing to the local fish shop is because there is some delay in the big packing as it is of the metal can and we will want to distribute it out together. Sorry for the long wait. The bigger packing for Pro series pellet feed, AR-G2 for Arowana and other species are being launched on Monday and is being introduced to LFS since Monday. You should be able to find it in some of the LFS if they have already place their order and the delivery has been sent to them if not it may take another few more days for them to receive their delivery. Alternately, you may want to purchase it over in our farm retail shop. Thanks a lot once again for your support. AR-G2 is being created to better enhance the coloration of the Arowana after receiving feedback from hobbyist that they will like to have something is able to give their Arowana better intense color development. Last edited by Qian Hu; 24-04-2015 at 10:44 AM. WOOHOO~ The long awaited period is finally over! 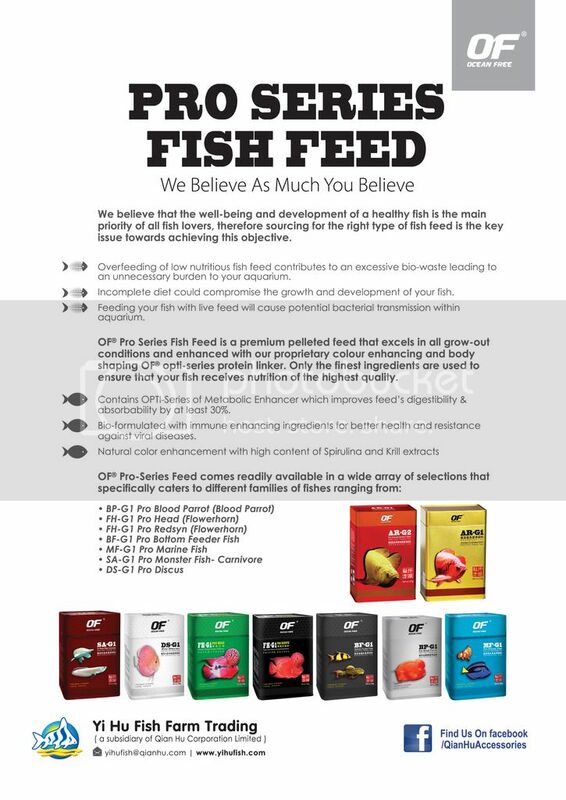 We're pleased to inform that our Pro-Series Fish Feed is officially launched in retail store now, both small and large pellets are available. You may wish to visit us @ 71, Jalan Lekar, Sungei Tengah Singapore 698950, Tel: (+65) 6766 1524 / 6766 1549 to make your purchase today! Is SA-G1 for monster fishes floating or sinking type pellet?